Artfully crafted with clean precision lines and a modern industrial style that make these Huntington Collection backless park benches a fantastic choice for	stylish, accessible bench seating. 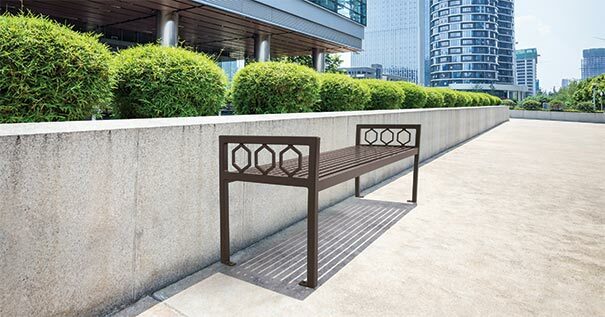 The innovative craftsmanship of these backless benches is expressed through the mid-century geometric inspired design and their solid all-steel construction that is engineered for both indoor and outdoor applications with an ultra-durable powder-coated finish. The bench frames are equipped with convenient built-in footings that accommodate for both surface mount installation and portable capabilities. These premium backless park benches are an excellent choice for both individual placement and for large-scale, multi-site furnishing with matching park benches, trash receptacles and tables with chairs the Huntington Collection is ready to deliver on lasting upscale impressions.